Join the discussion on our forums! 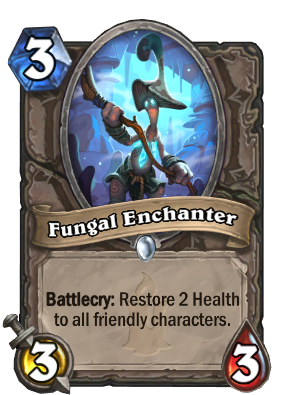 Come discuss Fungal Enchanter over in our dedicated Fungal Enchanter discussion topic. Good effect, good stats and cost and he's a cool Mushroom-man! How can I not put him in my decks? Good healing, 3/3 solid body, will definitely see atleast a little play. better version of darkscale healer, and much cheaper to cast. Better version BECAUSE it is cheaper to cast. Nope, this is also 1 hp short of having premium 3 mana stats, while Darkscale Healer has a 4 mana body and values the battlecry as 1 mana. Do you even know how much Darkscale Healer costs? But I mean the mana cost is not the only reason why it is better, what I'm saying is the body to cost ratio is better even though they have the same battlecry. If this was 2/3 this would be much worse but still better than Darkscale I guess. This is just better than Earthen Ring Farseer in most cases. I like it. Also has potential with Lightwarden in tempo priest, but that's optimistic. Move over Earthen Ring Farseer. There's a new sheriff in town.